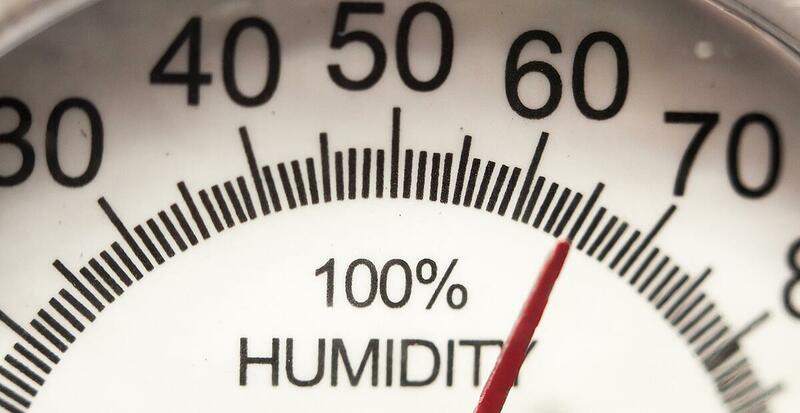 Humidity refers to the amount of water vapor in the atmosphere. Humid air feels wet, thick and heavy, and may also have a musty or unpleasant odor. Indoor humidity can represent a threat to both health and property — and that means it can hurt your business. It can be caused by climate or other factors. Mold, condensation, water damage or other signs of excess moisture can indicate a humidity problem. Fortunately, there’s an easy solution to controlling humidity indoors. A commercial dehumidifier can regulate the moisture in the air of any interior space — from a warehouse to an office to a crawl space — to give you peace of mind. Whether you are a facilities manager, maintenance manager or HVAC contractor who works in the field of hospitality, higher education, storage, manufacturing or production of perishable goods, you want to keep costs down and protect your goods, property or products. Proper humidity control also helps create a pleasant, healthy environment for workers, clients or customers, and other visitors to your commercial space. With nearly three decades of experience in the industry, we can help navigate the features of different models of commercial dehumidifiers to compare before you buy — and help you stick to your budget. Our commercial dehumidifier sizing form and this guide offer helpful tools to help you narrow down the options for your business. Those businesses that involve flood remediation and restoration can also often benefit from high quality commercial grade dehumidifiers that are portable. Hotels, schools, gyms and other facilities with pools or hot tubs need dehumidifiers designed for those high-moisture environments. Companies with perishable items — such as food — may need units specifically manufactured to work in low temperature environments. An indoor environmental systems expert can help you evaluate whether your business needs ongoing humidity control. When shopping for a commercial dehumidifier, you may wonder what brands stand out among the rest. Ebac is one such brand. Headquartered in the United Kingdom, Ebac is an industrial manufacturing company that specializes in commercial dehumidifiers. It is a private, family-owned business with an excellent track record and customer service. The North American division of the company is based in Newport News, Virginia. In North America, Ebac offers products that cater to companies needing cleaning and restoration and HVAC humidity solutions for residential, municipal and commercial settings. All units are manufactured in the UK. An Ebac commercial dehumidifier can remove as much as 560 pints per day or more, depending on the model. They can also work in as low as -4 degrees Fahrenheit, if your business has temperature control needs. Prices range from about $700 to $3,500. If you talk to an indoor environmental specialist, they will also want to know whether the space contains a pool, hot tub or spa. The amount of moisture a commercial grade dehumidifier can remove from the indoor air can range a great deal. You can find units that remove any amount from about 15 pints per day — or PPD — to nearly 575 PPD. Airflow ranges from about 170 to 1759. A pro will also want to know your electrical requirements and what kind of voltage and current your electrical system can handle. Electrical specs for a commercial dehumidifier range from about 115 volts to 460 volts. Fill out our Dehumidifier Sizing Form and get a free consultation addressing your specific needs today. Once you have the information you need to start shopping, refer to our comparison chart to narrow down your choices of Ebac models based on size, electrical specs and more. Note that Ebac’s smallest models — including the CD30, CD35, RM40 — use the refrigerant R134a. All other refrigerant style models contain R407c, which is the direct replacement to R22. As of January 1, 2010, per EPA regulations, no new manufactured product can contain R22, which causes ozone layer depletion. In addition to the sizing and electrical specs, your business may require additional features. Does the unit you purchase need to be ducted? Some units allow for ducting to or from another room or area. Do you need a wall mounted unit, or a stand alone unit? Some of the stand-alone units can be wall mounted with an optional wall bracket. You may, on the other hand, require a portable model. Some units have carrying handles as well as castors for easy maneuverability, which may be ideal for cleaning, restoration and even pest control companies. Some features to note: Hot gas defrost and reverse cycle defrost both automatically melt away frost buildup providing effective operation at low ambient temperatures. Reverse cycle defrost allows the unit to function smoothly in temperatures down to 33 degrees Farenheit without frost build-up. Humidistats can also be important features to some businesses. An internal electronic humidistat automatically switches on and off to save energy — and money — by maintaining the desired level of humidity with intermittent operation. An adjustable humidistat allows you to set your desired level of humidity control. A humidistat that can be controlled on the unit or remotely works well for businesses requiring a certain RH — or relative humidity — number. An integral high capacity condensate pump allows the unit to pump out the collected water, as opposed to having a gravity tube that leads to a drain. This is a good feature for commercial dehumidifiers that need to be installed in basement areas because the water is able to pump out to ground level. If a floor drain is not available for any application, a condensate pump is recommended. Companies that do cleaning and restoration sometimes need to keep track of the hours a unit runs on a jobsite so they can bill it properly, which makes an hours run meter feature handy. Talk to an indoor environmental solutions specialist about any specific needs or constraints you may have, and to make sure that any model you are considering has the features you need. Expect to pay between about $700 to $3,500 for a commercial grade dehumidifier. How much you spend will be influenced by the above factors, as well as other features your business may require. An indoor environmental specialist with decades of experience working with businesses from a wide range of industries can help you sift through the options of commercial dehumidifiers on the market to identify the most high quality, low cost solution. Educate yourself on the information that influences what you need, fill out our dehumidifier sizing form and get a sense of the Ebac models on the market in order to prepare for your consultation. Purchasing a commercial dehumidifier is a necessary investment for businesses with moisture control needs and issues due to weather or other factors. Like any big purchase for a budget conscious company, you want to ensure that the commercial dehumidifier you buy is designed to provide the level of moisture control needed for your space and conditions — without breaking the bank. Regardless of your budget and challenges, there’s a commercial dehumidifier manufactured to handle your needs. 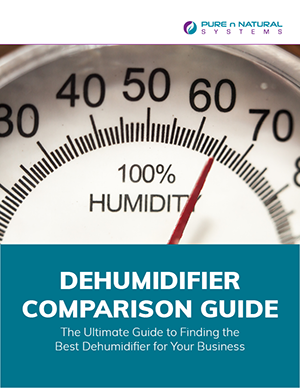 This article, the dehumidifier sizing form — and our downloadable companion comparison chart below — should serve as essential tools to help you zero in on the perfect model for your business. Want a portable version of this article?